Hi folks–The full moon rises at 6:57 p.m. today. Since I’m often inspired by benign lunacy, I decided to time the latest wave of the Carding Chronicles with the monthly phases of the moon. Please keep your eye on this space for an upcoming book sale because I have some inventory that I’d like to share with you! As my friend Dana likes to say—Carding books make great gifts. Virginia Somerville sighed loudly as she stretched out on the lounge chair she’d positioned just-so on the porch of her cabin in the Carding Campgrounds. It wasn’t summer until this moment arrived—early morning with nothing to do but listen to the kingfisher cackle as he hunted around Half Moon Lake. I have hours and hours of time, Virginia thought, with no principals, no parent-teacher conferences, no students, no grades, no tests, and no lesson plans. In other words, the days of teacher bliss had commenced. 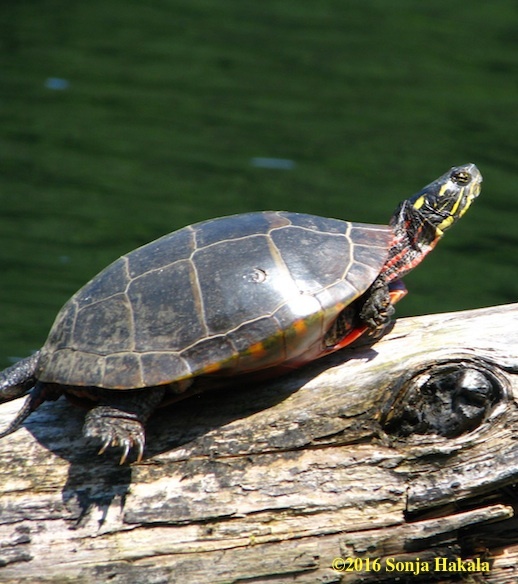 A turtle plopped from a log into the lake shallows as Andy Cooper slid by in his kayak. Every summer, Andy and his brother Charlie (both avid photographers) set themselves up in a friendly competition, choosing some obscure subject or another to see who could get the “best of.” This year, the subject was spiders and spider webs, the latter being visible only when wet with dew or rain. Which, of course, explained Andy’s early morning glide-by. Virginia thought of the whole event as cameras-at-ten-paces but like most other folks in the Campgrounds, she enjoyed hearing the stories that accompanied each triumph. Everyone in Carding knew you couldn’t get anywhere near a Cooper without hearing a good story. A shivery breeze caressed her bare feet as Virginia sipped her second cup of honeyed tea. In spite of her efforts to the contrary, she couldn’t stop thinking about the child’s notebook sitting on her kitchen table, the one begging to be read a second time. And then a third and a fourth. Not now, Virginia told herself. I need the peace, the solitude, this time of no-thoughts. The kingfisher cackled again, and Virginia saw it hook the water in a place known for its eels. She had a special fondness for the waterbirds because they looked, to her, as if they’d been made of spare parts. She hoped it had found breakfast. That thought provoked her own stomach, reminding her of the yogurt, peaches and granola waiting inside for her…along with the notebook. But Virginia rejected that possibility immediately. Tupelo (everyone called her Lo) was such a little thing, ethereal, as if she was built of more air than solid. No child that slight could be more than seven. With another, deeper sigh, Virginia gave in to her curiosity and hunger pangs, and meandered into her tiny summer kitchen. The notebook took precedence over food. Its first few pages were filled with the girl’s drawings, mostly of the moon and stars, but then the crayon yielded to words. Virginia washed the largest peach in her refrigerator, cut it into bits, and tumbled them into the bottom of a bowl. Then she scooped in some granola, and topped it all with her favorite maple yogurt. Tucking the notebook under her arm, she sauntered back out to her perch with the lakeside view. Virginia closed the notebook with a snap then laid her hand on top of it. Lindsay Jeffords, Lo’s second grade teacher, had tried and (in Virginia’s opinion) abysmally failed to reach the little girl. The result was a being that Virginia called “the Tupelo-waif” who drifted around the playground at recess, reluctant to join any group doing anything. If there was one thing that Virginia understood as a teacher, it was that the first law of group dynamics is that anything or anyone perceived as different creates unease among the members of the group. When difference is perceived, the members of the group close ranks to keep “the different” out. Virginia, on the other hand, cherished difference mostly because she found conformity dull. So the questions was—how would she protect and fortify this little girl? She caressed the notebook again while she watched the wind and water play with one another. It was only the first day of summer vacation, and Lo Handy was already taking up residence in her heart. Next thing you knew, there’d be back-to-school sales in the newspapers. Thank you for journeying with me to Carding, Vermont. If you subscribe to my website, you’ll find four short stories in your inbox every month, one on the full moon, one on the new moon, and one each at the waxing and waning half-moons. In between, there will be other moments to share. If you enjoy the Carding Chronicles, please encourage your friends to subscribe to this website, and talk about them on social media. And please review the Carding novels wherever and whenever you get the chance to talk about books. Your opinion matters more than you can imagine. The more folks who enjoy Carding, the more I get to write and the more you get to read.